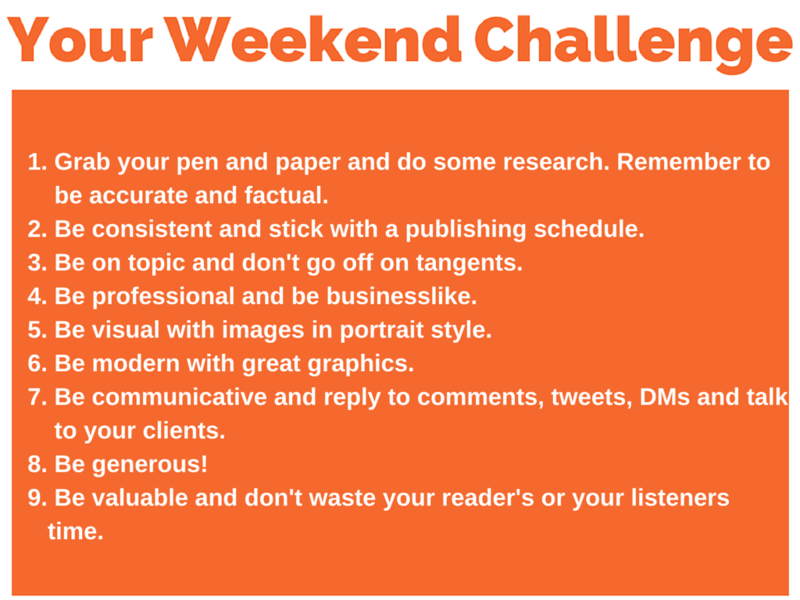 It’s Friday and this week for your weekend challenge, we are going to talk about how to be a better blogger. Of course, we’re not talking about blogging, I mean writing, communicating. On your website you should be using WordPress. It is a CMS. It is a content management system but it is also known just simply as a blog because it’s how it got started. Blogging has moved on, it’s very professional. In fact, I think the Ne York Times runs their websites on WordPress. So blogging is writing. You need to give constant valuable communication and writing and information to your audience. To you target audience and your existing audience and your potential audience and then send them to a social media and other sources and paid Facebook adds etc etc. But when you are taking time out of their valuable day, you need to be respectful of that time. The inspiration for these came from Rebecca Radice, who is fantastic on social media. She wrote an article that was on this similar topic, and it made me think because we tried our best with this. So get your pad, get your pen, and let’s start writing. Here we go. 1. Be accurate and responsible with your facts and research. Do not make stuff up. Do not assume, if you get it from someone else’s article, do not assume that they didn’t make it up. Just check it. There is the fantastic Google. Google gets better and better. But again, Google is not an authority. It is a search engine that brings out results of what people write. You can pay researchers but I’m just talking about just an average. Just check that what you’re saying makes sense. There’s plenty of websites and statistics with things you can use. 2. Be consistent and stick with a publishing schedule. On the Marketing for Owners website, you’ll find that we publish a post every single Monday and every single Thursday. Now that may change over time, but it won’t change from those days. We may add extras but we will always post on those specific days. You will also notice that on the podcast, we post on Monday, on Tuesday, Wednesday, Thursday, and Friday. We don’t have podcast on a weekend at the moment, perhaps we will in the future but those are always going to be there. You can also look how television and magazines do it. They’re consecutive and consistent. Magazines publish monthly, weekly whatever. They don’t miss one because they are a bit late or got out late that day, they don’t over filling sick. Copy what they do, be consistent. Don’t go off on tangents. Stick to your niche, don’t go off talking about all things about your personal life or something like that, unless it is part of your persona, your character and it warms the cockles of your costumers heart or your reader’s hearts. Alright. 4. Be respectful of their valuable time, don’t waste their time. Give them good stuff if you want them to stay there. Be professional, be business like. What I mean by that is, write in a professional manner or pick your persona, your avatar, your ideal costumer and write for them but be, if you’re a business, be businesslike. Don’t talk in text speak. If you’re going to write “going to” don’t write gonna. By the way, for all you transcribing people, gonna is not how you write going to. Just a side note. Someone’s going to be transcribing this. And we might get on of those gonna people. Be visual with images and use portrait style where possible. Portrait style, that one, as supposed to Landscape style, which is what you’re looking at this video in. So, if you turn the camera sideways, portrait style. Think about Pinterest for an example — people like to pin things on Pinterest. If you want to get more followers, people will pin your images if they’re large enough and they are the right shape and they look good. Be visual. Be modern. All the modern top blogs will have great graphics. Just use canva.com. Go there, it’s free. Load tutorials. Piece of cake. Even I could do it, and I have no idea how to use Photoshop. 6. Be communicative and reply to comments. Reply to tweets, DMs, which is direct messages, and talk to clients. For example, say you have a membership site. Say you charge $100 a month, you have 100 members. You’re making $10,000 a month. That’s pretty good. How about if you actually contacted them and asked if you could phone them or Skype with them and you contacted them twice a year so you got a 100 in every six months. Six months, 26 weeks. That goes to 25 easy Math, a hundred. That’s 4 a week. You’re going to have spent 10 minutes, 15 minutes talking, so 1 hour per week, 6 months speak to all of them. How many membership sites have you ever been in where or sometime, or had readers or subscribers or clients where people have got in touch with you and asked you, is what I’m giving out good? These include your blog. Say, can I talk to you and ask you a question. Please use a scheduler. You’ll only to get a handful of people who say yes but then you get to speak to them. They’ll be impressed, they’ll be costumers for life. Be generous. 7. Don’t just think it’s all you. It’s all me, me, me, me, me. People want to hear from others. You’re not going to be at the end of all of the information. If you send, say for instance, if I tell you, go and listen to everything Amy Portefield says, I’m not scared that you’ll never come back. Amy Portefield is way better that me. But she doesn’t have the same system I have and you have to pay more to get it. I learn a lot from Amy Portefield. So, I’m going to say, go and listen to her, she’s great. Am I scared that you won’t come back to me? I know half of you will even go look for her. But if she’s got information, I want you to know all of the good information. Remember at the start I said this is inspired by Rebekah Radice. Her website is Rebekahradice.com. You’ll find her article that is similar to this one on her blog. It has excellent graphic images as well. 8. Be valuable and don’t waste your reader’s time. Give something of value all times. If you haven’t got something to say, you don’t need to blog or post every single day. If you haven’t got enough to say and you haven’t got enough people to write, don’t try and promise to do it everyday. 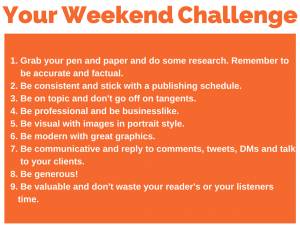 Write once a week, or once every two weeks. I recommend ones a week by the way. Try your best, don’t over stretch cause then you’ll let yourself down and your readers. Be valuable, give them quantity, give them quality on and give them images. Make it easy for them to read all that kind of stuff. That’s it. Above all, be lovely. Have great time with your friends. Have great time with your family, it’s a weekend. Use sunscreen if it’s sunny. 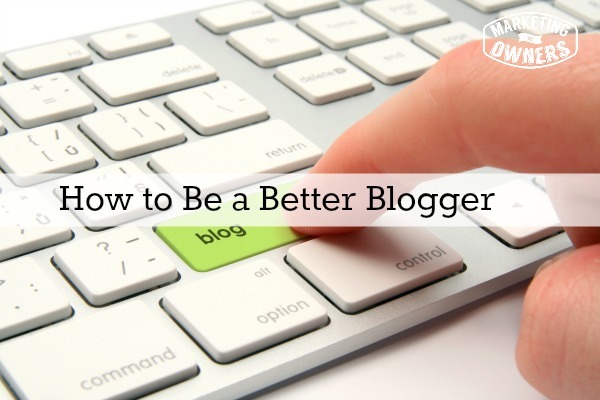 What can you do to be a better blogger?